An article accepted for publication in the journal “Geophysical Research Letters” describes a series of observations at ultraviolet carried out with the Hubble space telescope of the planet Saturn’s northern aurora. A team of researchers conducted a campaign of observations over seven months before and after the northern summer solstice to get the maximum possible visibility for the aurora. The coordination with the Cassini mission’s Grand Finale offered new information about Saturn’s magnetosphere. The glorious mission of the Cassini space probe ended on September 15, 2017 but in the previous weeks, during the period called the Grand Finale, it kept on collecting data and among other things carried out observations of the planet Saturn’s northern aurora. In the same period, the Hubble Space Telescope’s STIS (Space Telescope Imaging Spectrograph) instrument was used to conduct observations at ultraviolet frequencies, the only ones that allow to see that aurora due to the dominant presence of hydrogen in this gas giant’s atmosphere. 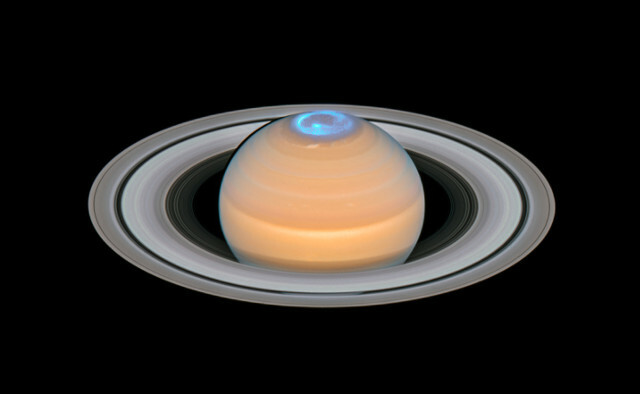 It wasn’t the first time that the Hubble Space Telescope was used to study the Saturn’s aurorae: in 2004 it was the southern aurora while in 2009 both polar aurorae were studied thanks to a favorable position of the planet with respect to the Earth where it was seen with its rings edge-on and both poles and their aurorae observable at the same time. In 2017, the coordination between Hubble and Cassini allowed to obtain excellent results in the study of Saturn’s magnetosphere since the aurorae are generated by the interaction of the planetary magnetic field with solar wind. In this case, the images revealed a considerable variety of emissions with very variable localized features. That’s due to the combination of the solar wind and Saturn’s rapid rotation, which lasts just about 11 hours. This new northern aurora showed two peaks of brightness: one at local dawn and one just before the local midnight. The latter was never noticed and could be specific to the interaction of solar wind with the planet’s magnetosphere in the solstice period. Aurorae are a common phenomenon, so much so that they were also observed outside the solar system for example in brown dwarfs, but differences were found among the various aurorae examined. The characteristics of the atmosphere is certainly a factor as well as the interactions with the Sun or other celestial bodies that generate them. Each new discovery helps to better understand these phenomena and how a magnetosphere works. In the Earth’s case this is really important as it’s a shield for the planet.